FolderSync is a Cocoatech-developed folder comparison and synchronization engine available exclusively in Path Finder 7. Aptly named, because that’s exactly what it does. In normal Cocoatech fashion, it combines the best of a simple user interface, an extremely customizable set of options, and the standard reliability that Path Finder has been known to provide for over 13 years. We’ll go into a little detail of this amazing feature below. We’ll start by accessing FolderSync. Simply select two folders to be compared/synchronized, bring up the contextual menu, then select the “FolderSync” option. 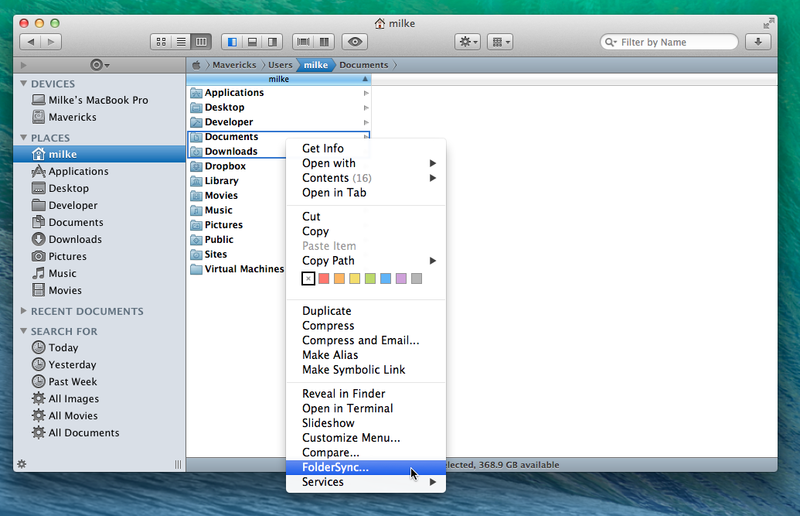 You can also access FolderSync in the “Command” menu, when in Dual Pane mode. Comparing folders is one of the more simple tasks that FolderSync can do. Shown below is the FolderSync interface. Currently, FolderSync is in “Compare” mode, as indicated by the drop down menu on the top-right of the window. On the left pane, we see the “Documents” folder, and on the right, the “Downloads” folder. These are the two items being compared, each having their contents listed below them. Also note that the full path to the directory folders are shown in their respective columns. Below, we can see the text color editor for different folders/files. This menu is brought up by simply clicking the “colors” button. Each color has its own designated meaning, and each color is completely customizable. The default colors are shown in the image. In the image below, we’ve brought up the preset menu by selecting “Presets”. We selected the preset “Mirror to left”, meaning we’d like to mirror the contents of the right folder to the left folder. In this menu, we can also select our synchronization options for each preset. The default options are shown in the image. For the options we’ve selected, the items that are “orphaned”, meaning items that are in one folder, but not in the other, are to be deleted. Note the red “delete” tags on items that are orphaned. These tags are all clickable to toggle that action on the item. The ones with “add” tags will be added from the right folder to the left folder. Again, you can select to leave out individual items by simply clicking on the colored tag in the middle “Action” column. 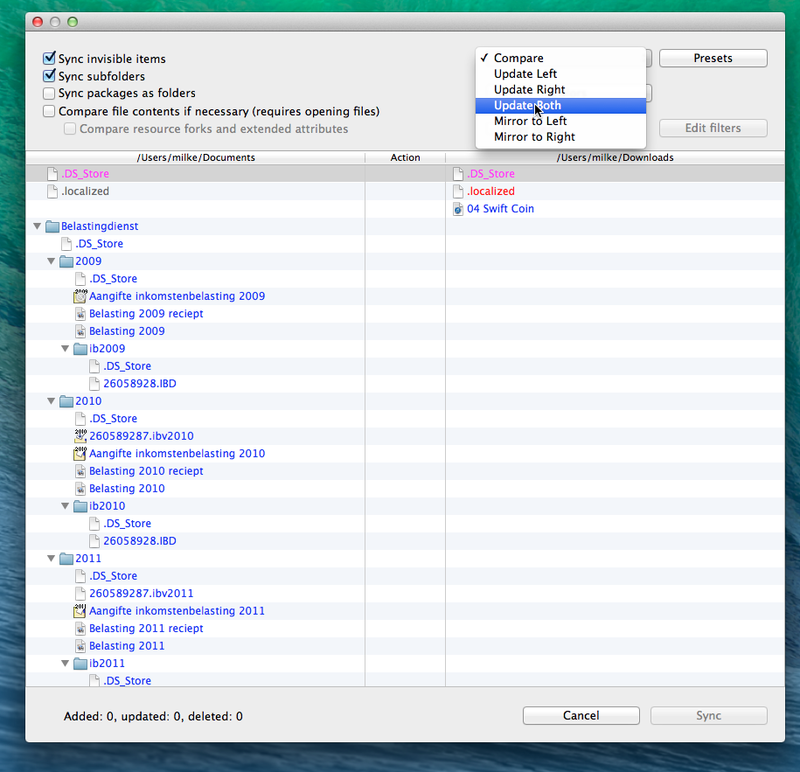 5 synchronization options and a comparison option- FolderSync’s full arsenal. FolderSync’s capabilities are so powerful that we couldn’t possibly explain all of its features and capabilities in a single blog post, so we hope to provide screencasts that go into full detail of FolderSync. At Cocoatech, we’re fully committed to making Path Finder 7 the most productive app out there, and FolderSync is another step in that direction. So far, we’ve announced Dropbox integration and FolderSync as two big Path Finder 7 features, but we’re not done yet. Be on the lookout for more Path Finder 7 announcements. Thanks for your support! Stay organized. Hi. This is great news! Alexander- We anticipate a 2014 release, but that’s all we can say right now. Sorry! Enter your email address below to follow this blog and receive notifications about the best alternative file browser, Path Finder.